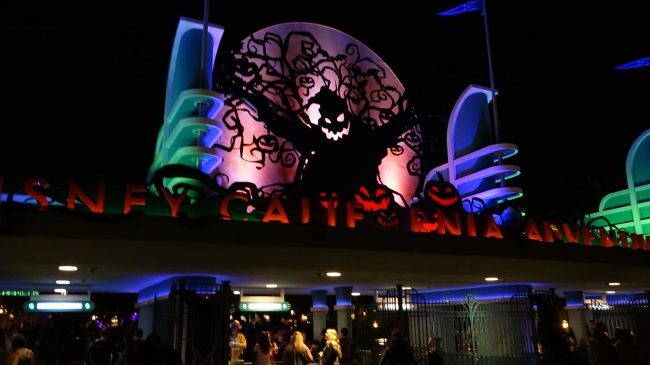 With all-new spooky ride overlays and festive decor, Cars Land “Haul-O-Ween” is the resort’s new hot spot for Halloween fun. I pulled up to the Cozy Cone to sample the Slow Burnin’ Mac & Cheese which is served in a black cauldron cone. I should start by saying I am usually not a fan of “themed” black food like hamburger buns and such. 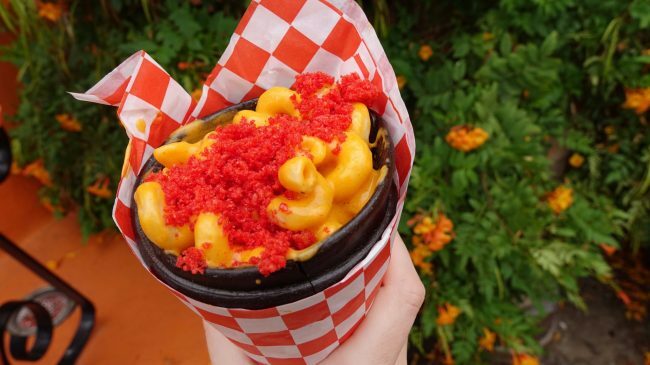 I couldn’t finish eating the bland and boring cone, and the mac & cheese was just OK, but the spicy cheese sauce and red chili-cheese puff topping gave it a nice kick of flavor. Next up at the Cozy Cone is some flavored “popcone” with some special Junkyard JamBOOree Mix on top. I’m a fan of combining sweet and savory things – for example I firmly believe that pineapple belongs on pizza (do not fight me on this). I went with buffalo ranch seasoning for the popcorn which was a little overpowering but I didn’t “tire” of it (sorry, the temptation to use Cars puns is overwhelming), and the “nuts and bolts” topping was a mixture of M&Ms, candy corn, chocolate-covered pretzels and Boston baked beans. 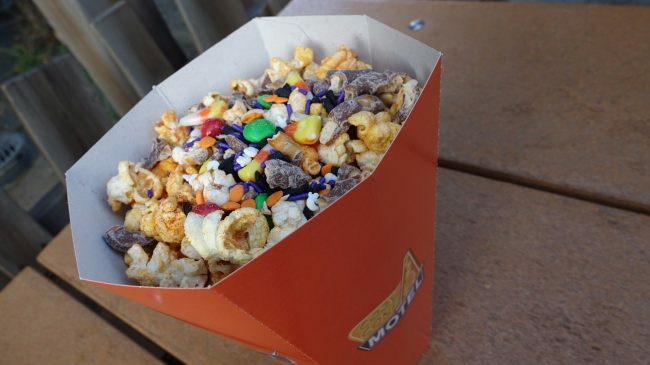 I thought the sweet-crunch mixed with salty-crunch was worth the extra dollar for the novelty. 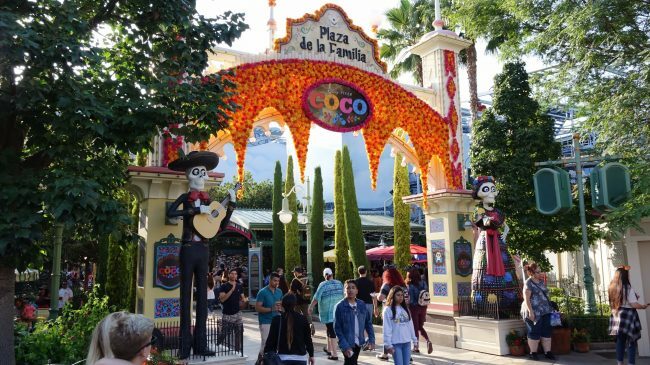 Next let’s hop over to Paradise Gardens for the all-new “Plaza de la Familia”, celebrating Pixar’s upcoming film “Coco” and the spirit of Día de los Muertos. Make sure you catch the new show, A Musical Celebration of Coco (or watch my video of it here). I really enjoyed it. The special event menu at Paradise Garden Grill includes sirloin beef tacos, crispy potato cakes, herb-braised chicken and desserts including a tres leches parfait, but I ordered the Yucatan-inspired chicken tamales and I’m so glad I did. 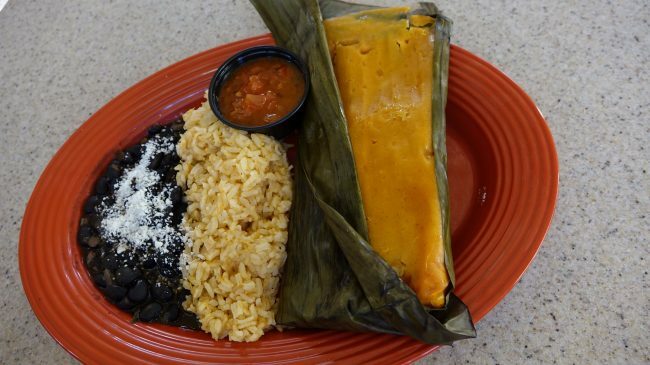 It’s steamed in banana leaves and served with ranchero salsa, golden rice and black beans. Flavorful and delicious! I continue to be so impressed with the food from this underrated quick service location. 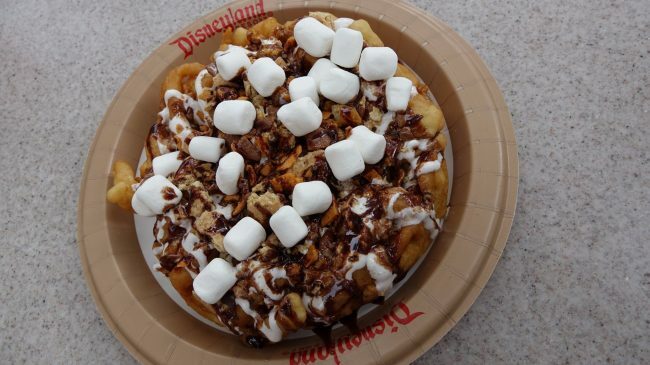 At Frontierland’s Stage Door Café was something I couldn’t resist trying: a Campfire S’Mores Funnel Cake. Just the name of it brought back memories of roasting marshmallows and telling ghost stories around a campfire in the wilderness like I did as a kid in Boy Scouts. I wished the marshmallows on this funnel cake were a little gooier, and I was left wanting more chocolate drizzle, but I really liked the crushed graham cracker and peanut butter candy. The portion size is smaller than other theme park funnel cakes I’ve tried, but at $7.49 it’s a decent value. Which Halloween Time treats have you tried? Leave a comment below or let me know on Twitter at @DLthings. Thanks for reading!